Preheat your oven to 180ºC, 160ºC Fan. Mix the dry ingredients together in one bowl, except for the chopped chocolate. Melt the butter and 100g of chocolate over a pan of simmering water, taking care to not let the water touch the bottom of the bowl. Once melted, stir to combine, and leave to cool to room temperature. Whisk in the beaten eggs. 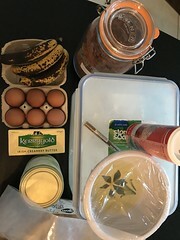 Add these wet ingredients to the dry ingredients. Stir until just combined, then add the mashed bananas and the remaining 50g of chopped chocolate. Pour into the prepared tin. I use a deep rectangular tin, approx 30cm * 20cm. I grease this and line it with baking parchment. Bake for 25 -30 minutes until it is set with just the tiniest of wobbles in the centre. 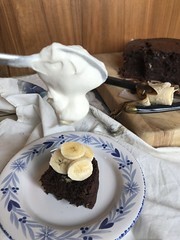 On this occasion I served the brownie with some sliced banana (going for all those health benefits!) and a big dollop of cream. Divine.